Last weekend (July 25/26) the RMTC hosted ARTA’s Australian Women’s Amateur Singles and Doubles. The field was small but the leading competitors were on show. In the singles event Rosie Snell showed that she is still up there with the best when she easily knocked off the young(ish) upstart Xanthe Ranger 6/3 6/2 to set herself up for a tilt at the title against reigning champ Laura Fowler. The final was as good as you could wish for with great rallies, volleys, winning galleries, nervous mistakes and cunning serving all on display. The first set was won by Laura 6/3 in what at that stage was shaping as a somewhat predictable match, however, from then on nothing went to any sort of script. Rosie’s game plan of playing to Laura’s backhand allowed her to take a strong lead in the second set before Laura fought back to level it at 5/5. Rosie started the last game at the service end but when Laura blazed away to lead 40/15 as well as laying a chase better than 2, the match looked over. At the change of ends Rosie ripped a crosscourt forehand to win the chase and then closed out the set with aplomb. Rosie’s form continued in the 3rd set until she led 5/2 only for the match to turn again. As Laura lifted her game, Rosie seemed to forget about hitting to the backhand corner and before we knew it the score was 5/5 in the 3rd. Laura’s comeback was also aided somewhat by Rosie’s belief that her Pound serve might catch Laura out, unlikely given Laura’s speed of foot. At 5/5 and then deuce, Rosie then held her first and only match point which Laura duly saved with a forehand volley. Congratulations to both players and to Laura for retaining the Australian Women’s Amateur Singles Title. The doubles was split into to 2 divisions. In the main draw Laura and Xanthe showcased their skills in another good match against Prue McCahey and Rosie providing spectators with another 3 set tussle. In Division 1 Anabelle Guest and Julia Page were too steady for the fast improving Royal South Yarra pair Kim Dudson and Brigitte Claney. During the second set the lawn tennis strokes of the RSY pair started to show but a few well placed forehands from Anabelle coupled with Julia’s gritty ground strokes held them off. Guest/Page def. Claney/Dudson 6/2 6/5. The Christmas in July Mixed Doubles. Eight pairs celebrated Christmas in July at the club on Saturday evening. The ladies drew their partners, none seemed put out by their choice, and we all reconvened bright and early the following morning to play tennis. James Guest and Kate Leeming emerged triumphant; they defeated Andrew Schnaider and Judith Sear in the final by 6 games to 4. In her final tournament before her jaunt across Africa, Ktpie demonstrated that she is not just a renowned ultra cyclist, but also a highly competent tennis player. She also suceeded where many have failed in rendering her talkative partner almost silent in admiration of her many obvious qualities. Pliant though he was, JVCG showed off a wide range of serves, some of which worked quite well. Judith connected with a number of cracking shots, but frustratingly for her many of them were returned. Andrew was clearly below par, yet coped manfully with the demands of 5 matches in a single morning: his uniquely extreme ‘frying pan’ grip on the backhand volley provided amusement to the spectators plus the occasional winner. It was a noticeably friendly group of players, almost all of whom lingered long after the organiser had served a picnic lunch, enjoying the conviviality of each other’s company. John Hewson was so overcome by the fun time he had that he telephoned twice, on consecutive days, to thank me for running the event. Ed Hughes (past President of the USCTA) with Pat Dunne, Paul Rosedale, Daniel Williams (partly obscured) & Hilton Booth (Australian #1 & captain). The apparition on the right of shot is Simon Carr. The Australian team of Hilton Booth (Hobart), Pat Dunne (Hobart), Daniel Williams (Ballarat & Melbourne), Simon Carr (Melbourne) and reserve Paul Rosedale (Melbourne) lost the inaugural Limb Trophy match 8-0 to a very strong UK team at Lord’s recently. 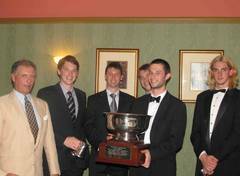 They then travelled to Newport, where they regained the Clothier Cup from the US team 5-3. B-Grade Pennant 2009 completed on Thursday. 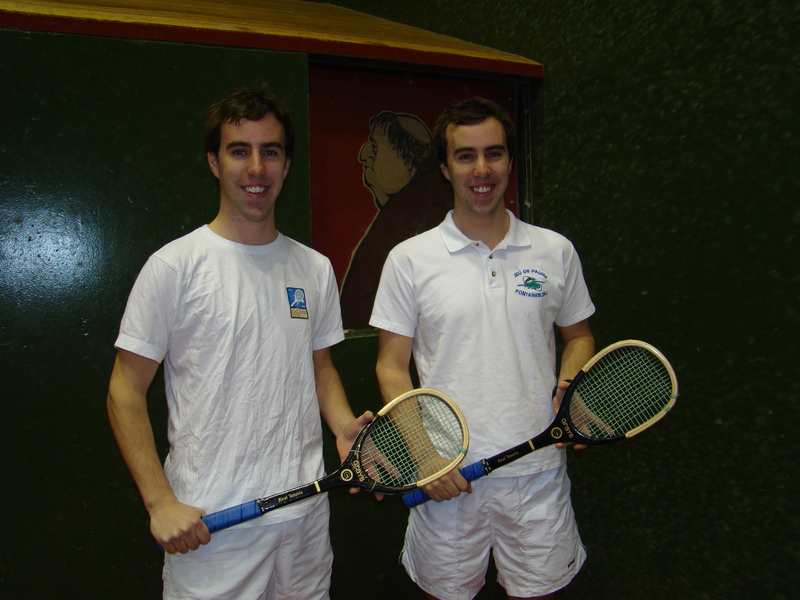 The winners were the progressive Welch twins, who defeated James Wheeler and Tim Robinson by 2 matches to 1 in the final. Two days earlier D-Grade Pennant had terminated in disarray, the ‘winning’ team of 3 being made up entirely of fill-ins.